NDS Group, a digital TV technology company controlled by Murdoch's News Corp., may be the best kept secret in the media business. NEW YORK (CNNMoney.com) -- Apple. TiVo. Cisco Systems. These companies are trying to establish a presence in your digital living room with cool, innovative technology to help link the computer and TV. And these companies are all widely recognized both on Wall Street and Main Street. NDS is a majority-owned subsidiary of Rupert Murdoch's News Corp. But few investors have heard of the company. NDS has been a better - and less volatile - investment than the more well-known TiVo over the past year. But one of the most innovative firms in the lucrative business of digital content is one you've never heard of: NDS Group. And that puzzles some Wall Street analysts, particularly since NDS (Charts) is a majority-owned subsidiary of News Corp., the Rupert Murdoch-controlled media conglomerate that owns the Fox movie studio and TV network, various cable channels and popular social networking site MySpace. News Corp. (Charts) owns about 74 percent of NDS. "This is an undiscovered gem," said Daniel Meron, an analyst with RBC Capital Markets. "It's extremely well positioned in a growth market and has an excellent management team. But few people know of it." NDS, which has headquarters in the United Kingdom and New York, develops technology, such as digital TV smart cards (which store consumer-viewing information), software for cable set-top boxes and digital video recorders for cable, satellite and phone companies across the globe. The company reported earlier this week that profits for its fiscal second-quarter increased 17 percent from a year ago to $30.3 million, and that sales were up 8 percent to $165 million. For the full fiscal year, which ends in June, analysts are predicting that revenues will increase by 13 percent and that earnings will increase 26 percent. Its biggest customer is DirecTV (Charts), the satellite TV firm that News Corp. currently owns 39 percent of. However, News Corp. has agreed to swap its stake in DirecTV to John Malone's Liberty Media. NDS replaced TiVo (Charts) as the exclusive supplier of digital video recorders for new DirecTV subscribers in 2005. David Richardson, director of new media and business development liaison to the content industry for NDS, said that the transaction with Liberty Media should not have an effect on NDS's contract with DirecTV. Still, NDS's dependence on News Corp.-controlled businesses may be one reason why few investors have heard of the company. After DirecTV, NDS's next biggest customers are BSkyB, the British satellite TV firm that News Corp. owns 39 percent of, and Sky Italia, a wholly-owned subsidiary of News Corp. These three companies accounted for nearly 70 percent of NDS's revenues in the six months ending this past December. "The overhang for investors is that News Corp. owns so much and accounts for so much business," said Alan Bezoza, an analyst with Oppenheimer & Co. But the fact that NDS is not readily known in the U.S. should not be a problem for investors, Bezoza says. He argues that the battle for the DVR set-top box business in the U.S. is not worth fighting since the two leaders, Cisco Systems (Charts) and Motorola (Charts), have turned DVRs into commodities. So NDS's focus on international markets is a smarter strategy, he thinks. "There are a whole lot of opportunities outside the U.S. where Motorola's and Cisco's presence is nonexistent," he said. In other markets, NDS primarily competes with Swiss digital security firm Kudelski, which recently acquired a voting stake in interactive TV technology firm OpenTV. And Richardson said that the company is steadily gaining new customers outside of the News Corp. family. He said one thing media companies like is that NDS is happy to be behind the scenes and let its customers use their own brand name, not NDS's, on set-top boxes, digital video recorders and other products. "We're an infrastructure supplier. If there is one thing we are religious about, it's not to compete with our customers. TiVo failed with DirecTV because it didn't understand that," Richardson said. To that end, Richardson said that NDS has been partnering with other media companies as well. It has developed interactive games based on cartoon characters from Viacom-owned Nickelodeon that are available on DirecTV and also supplied technology to a Walt Disney-branded mobile digital media player. 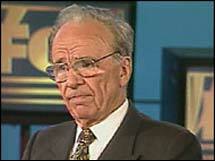 But Richardson conceded that having News Corp. as its top shareholder sometimes gets in the way of deals. "Attempts at partnerships sometimes run afoul," he said. And as more and more companies tout their own digital TV offerings, Richardson thinks that it will be easier for NDS to tout some of its technology to cable, satellite and phone companies, such as set-top boxes that allow people to watch videos from the Internet, or files stored on their computer, on their TV sets. "Apple validates us," said Richardson of Apple's (Charts) new Apple TV product, hardware that will wirelessly transmit videos, photos and other content from the iTunes library on a user's computer to their television set. With all this in mind, both Bezoza and Meron said they think shares of NDS are a good bet. The one big caveat is that the stock is not actively traded. Since News Corp. owns such a large stake, the average daily volume is less than 100,000 shares over the past three months. But the stock, which gained 17 percent in 2006, still looks attractively valued. Shares trade at 21 times fiscal 2007 earnings estimates and analysts expect earnings to increase at a 24 percent clip annually, on average, for the next few years. "NDS is not a brand name like Motorola or TiVo. It's working behind the scenes and doesn't want to get between the customer and the service. But this is not a bad thing," said Meron. "If you are a long-term investor, this is a really good stock to own." Analysts quoted in this story do not own shares of NDS and their firms have no investment banking relationships with the company.